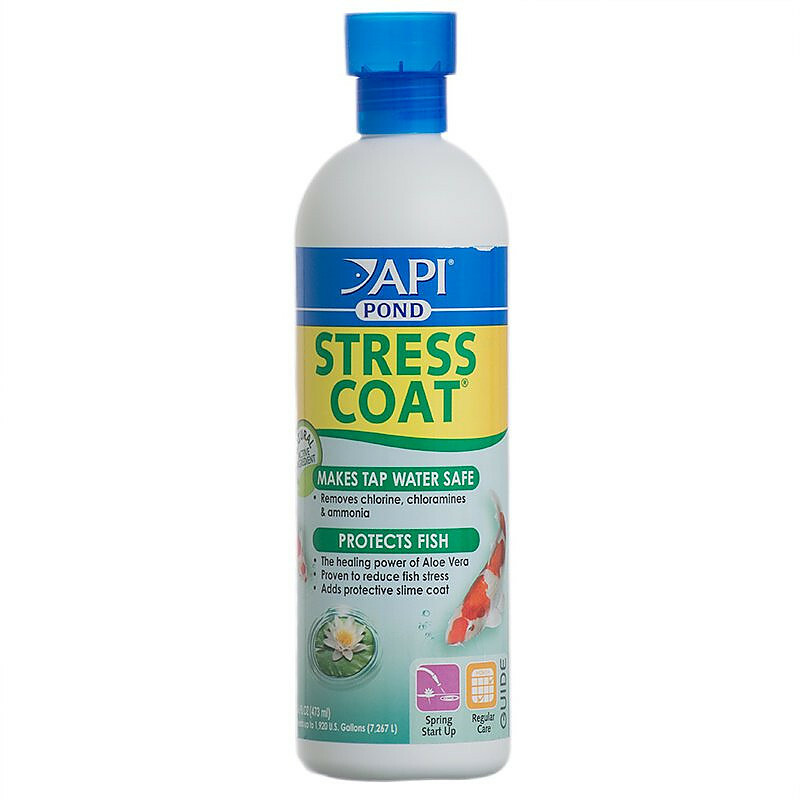 API Pond Stress Coat instantly makes tap water safe for fish, removes chlorine, chloramines and toxic ammonia, reduces stress and adds a protective slime coat for enhanced disease prevention. Use during start-up and regular water changes to help keep your fish healthy and your pond water safe. Stress Coat completely neutralizes and removes chlorine, chloramines and ammonia and detoxifies heavy metals to make water from the hose safe for pond fish. It replenishes the natural protective slime coat, making fish less susceptible to disease during times of high stress. Stress Coat is made with Aloe Vera, which promotes healing and helps restore damaged skin, fins and other fish wounds. Use whenever adding tap water or fish to the pond or when fish are injured. Directions: When adding water to the pond: add 4 Tbsp. per 240 gallons of pond water, or 1/2 cup for each 48- gallons. In areas of known high chloramine use by local water companies, double the dose for added fish protection. When introducing fish to the pond or to promote healing: double the dose. Note: Formerly known as Pondcare Stress Coat Plus. Pet Mountain has the highest quality products at the best prices. Great price in buying in bulk. Delivery was quick and very well packed. Will definitely purchase from Pet Mountain again. GREAT PRODUCT, I'VE USED IT SINCE I FIRST PUT IN MY POND.8 YRS AGO. EASY TO USE. GREAT PACKAGING FOR SHIPPING. 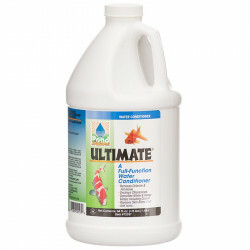 Not only does this product help build slim coat and help condition the water but it also helps clear the water. This hot year my pond has been awfully murky, but once I add the stress coat it's crystal clear. I started using this product after my fish were distressed or getting sores on their bodies. Part of the cause may have been from adding tap water to the pond. I tried Stress Coat each time I added water to the pond or when I added Algae Fix. Since then, all my fish have continued to thrive without suffering from sores. I highly recommend this product to care for you fish. This is the best stuff I have ever used. I raise Koi inside in aquariums and then move them to the pond for sale. 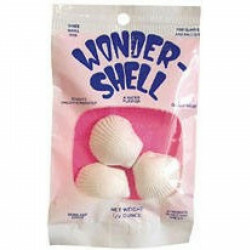 The fish love it and it keeps their slime coat and keeps them happy during water changes. 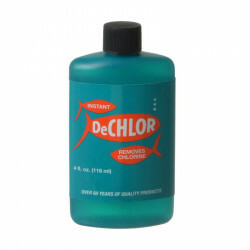 I swear by this product when you use it in combination with the correct amount of Pond Salt! I have had my pond for 4 years and for the last 2 years have used the Pond Care product line with wonderful results. I found that Pondcare Stress Coat works great in all of my Cichlid Tanks, and is a lot cheaper. I have never lost a fish at a water change since I started using Pondcare.